Our villa is situated on the prestigious Calabay Parc - Tower Lake. Set on a beautiful lake side, secure community which features a Clubhouse, with Snack Bar, Picnic Area and a slip way for boats, also the lake is stocked for the fisherman and there is a jetty for fishing as well as beautiful lakeside walks. 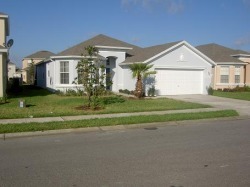 The community is less than 20 minutes from all the attractions at Disney, and is surrounded by Professional Golf Courses. 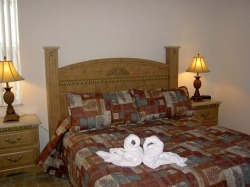 Our villa has been constructed to the highest standards and is fully air-conditioned. 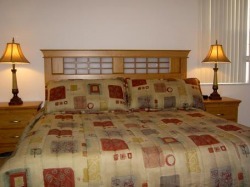 There are two master bedrooms with 'King sized beds' and en suites. Master Bedroom 1 has an enhanced en suite with large shower area, 'tub' bath, and twin sinks, and Master en suite 2 has private access to the pool area. There are two further bedrooms, one double and one twin which are connected to a family bathroom. The living area features a large Family Room with ample seating which has views through the triple aspect doors out to the lanai, extended patio area and pool. 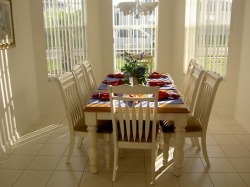 There is a spacious Kitchen with upgraded appliances with an adjacent spacious Dining Area with seating for ten. There is a utility area with washing machine and tumble dryer which leads through to our Games Room. 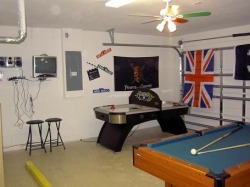 The Games Room is equipped with a PS 2, Pool Table, Electronic Darts and Air Hockey. 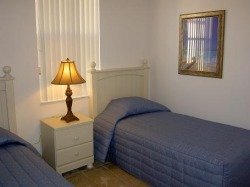 All bedrooms come with TV's and DVD players, with the Family Room having a larger screen TV and DVD. All TV's are cable connected. Outside to the rear of the villa is the extended deck area and large private pool. there is ample poolside furniture provided as well as an electric BBQ. The pool has lighting as will the pool area for those quiet relaxing evenings. The pool can be heated for those cooler months (heating charges apply). For added safety there is childproof safety fencing between the lanai and the poolside area. The villa is equipped for all your needs, including free use of stroller, cot, and highchair. 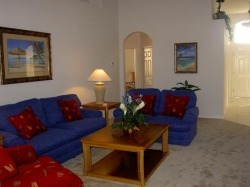 Our Living Room is superbly furnished to give a relaxing atmosphere. There is a TV (cable connected), DVD Player with a selection of films, and a Video Player. 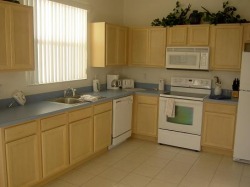 Our spacious kitchen area is fitted with with everything needed for your stay. Adjacent to our Kitchen Area is our spacious Dining Area which will comfortably seat eight people. This has a King sized bed and TV (cable connected) with DVD Player. The guest bedroom has a King sized bed, TV (cable connected) , and a DVD Player. 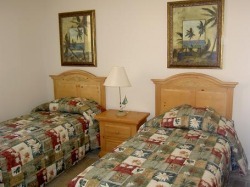 The En suite has a private access to the Pool/ Lanai. The Games Room is fitted out with a full size Pool Table, Air Hockey, as well as a PS2 with games and an Electronic Darts game. There is also a mini Hi Fi supplied. Our west facing large pool and covered lanai enjoys the sun from mid morning to late in the evening.